It was predicted a few months ago. 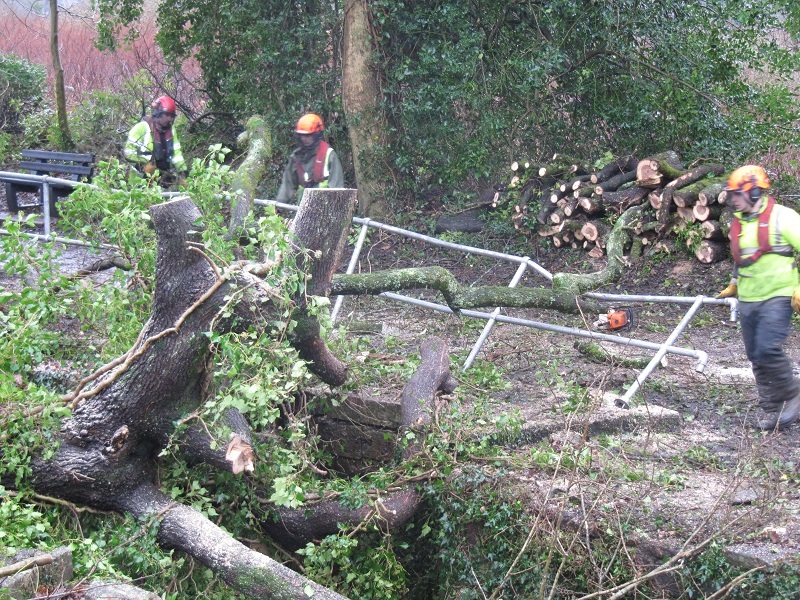 The oak tree on the off-side at the Upper Trebanos Lock had looked top heavy and insecure for some time and both Malcolm and John at CRT had reckoned it would be a devil to get rid of when it did go. Well, fall it did on the 3rd of January, buckling the lock chamber protective railing and completely blocking the tow path. 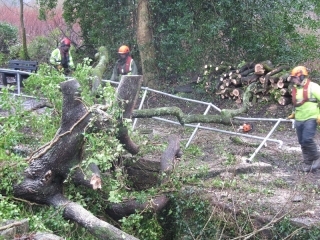 The contractors were in this morning and had already cleared the tow path when I arrived at ten. They had moved on to cutting the tree into manageable logs with their chainsaws. The stump which has taken some of our wall and our lime mortar replastering into the by-wash will be difficult to get at and move. We hope that the cost of the endeavour will not financially affect the CRT plans to replace the stop planks on both Lock Chambers in time for the Waterways Recovery Group arrival in July. Previous postWhen the Rains Came to Ynystawe Next postThe Canal From Player's to the Mond: Then and Now. We are being extra nice to Nick at CRT just in case the stop plank funds are used for tree maintenance at the lock. It is all in the balance(as are the trees! ).